Pure Maple Syrup, Etched Carafe, 16.9 oz. Pure Maple Syrup, Quart Mason Jar, 32 oz. The label on this 8 oz. 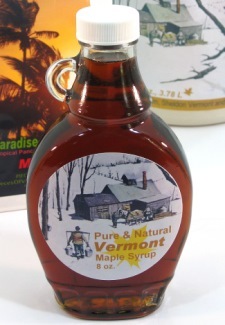 syrup bottle has a maple sugaring theme that immediately tells the story of how pure maple syrup is made in the snowpack of northern Vermont. 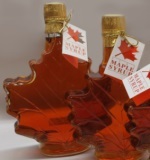 Filled with Pure & Natural Grade A Amber with Rich taste maple syrup this bottle makes a wonderful complement to your breakfast table. It's just the right size! Vermont has a new grading system. This syrup would formerly be called "Grade A Medium Amber", which is the middle of the road syrup grade. 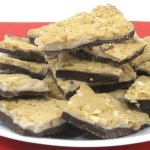 Not too delicate a flavor, not to heavy, it's just right! Please Note: Other syrup grades are available, but we will need additional time to fill the order. Please give us a call for special requests.